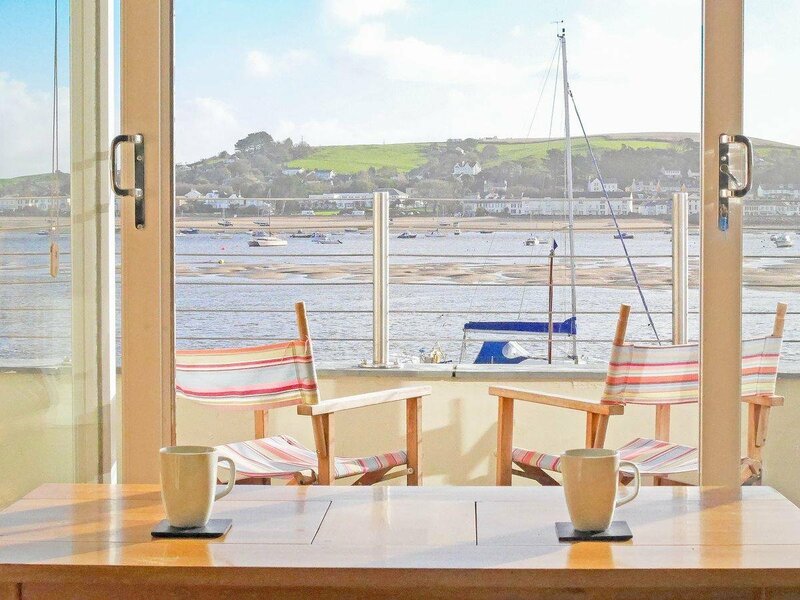 Situated in an enviable position on the banks of the Torridge Estuary, the decked roof terrace and the private balcony both give unrivalled viewing platforms that perfectly capture the constantly changing coastal scene towards the pretty village of Instow and beyond. It provides the perfect location for both sunbathing and boat watching as well as being an excellent setting for al fresco dining on the terrace. Its close proximity to the water means crabbing is possible whilst sitting on the edge of the balcony during high tide, which is also great for children and adults! Shorewaters Cottage has been sympathetically renovated for holiday lettings and offers stylish living accommodation in neutral, contemporary tones. It can comfortably sleep six people and benefits from two double bedrooms, both with river views, a third bedroom with bunk bed and a spacious open plan living/kitchen and dining area. There is also a bathroom with a shower over bath and an additional toilet. Open plan living space: With wooden floor and patio doors leading to balcony. Kitchen area: With electric oven, gas hob, microwave, fridge, dishwasher, coffee machine and washer/dryer. Bedroom 1: With kingsize bed.Gas central heating, gas, electricity, bed linen, towels and Wi-Fi included. Travel cot and highchair. 2 balconies with outdoor furniture. Roof terrace. Public car park. No smoking. Please note: There is a tidal river in the grounds. Be the first one to tell us about your rental experience while staying at Shorewaters. Let us know if the listing matched your expectations. You can share your comments about the location, property owner/manager and all the unique features that made your stay a memorable one.